RMT members have voted strongly for strike action, in what stands to be the first national strike of rail workers in 16 years. Other workers including signallers and electrical supply controllers may also strike following their ballots in the coming weeks. Railway maintenance workers have voted for strike action in an RMT-organised ballot, with the prospect of strikes over the Easter bank holiday - the most effective time to take action – still on the table. Network Rail plans to axe 1,500 jobs, alongside introducing increased weekend working for its staff. According to the RMT, workers are concerned about the safety implications of the redundancies alongside an increasing workload, antisocial hours and the prospect of compulsory redundancies. 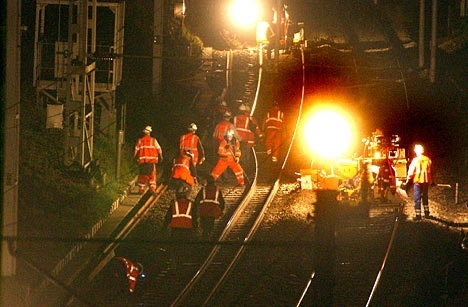 Network Rail's plans have already faced criticism (including from the Office of Rail Regulation and 150 MPs) on safety grounds. 77% voted for strike action, with 89% voting for action short of a strike. The turnout for the ballot was 65%. No strike dates will be announced until the 19th of March. Meanwhile, further strike action is brewing amongst other sections of workers in the industry. 5,500 signal workers could strike following the announcement of their ballot, due to take place next week. Even Network Rail management has conceded that a signallers' strike would paralyse significant sections of the rail network. The RMT has suggested the prospect of a single strike by both sets of workers. On top of this, the TSSA union announced today that it would ballot 1,600 of its members including electrical controllers over a 0.8% pay offer over the coming weeks. The union announces the result of a separate ballot of 2,000 of its members tomorrow. For those who didn't already know. Railway depot supervisors have also voted to strike in a TSSA - organised ballot over the same dispute. Details here. Network Rail bosses have gone on the offensive, taking out newpaper adds attacking the strike. There are clear fears about the scale of the action, especially if the signallers do come out.